About 70 percent of American companies have exactly one employee—an army of small, efficient businesses that usually do one simple thing well. Think plumbers, graphic designers and IT consultants. Then there are the massive corporations. From fast food chains to department stores to technology firms, these companies employ hundreds of thousands of workers while solving complex logistical problems, from transportation to supply chain management. In order to rank America’s largest corporations in terms of employment, FindTheCompany turned to public filing data, with help from Zacks Investment Research. Specifically, they focused on the 2014 10-K filing to ensure an apples-to-apples comparison. As a result, this list will include only companies publicly traded on U.S. exchanges. That means a few foreign companies will still make the list (ex: Volkswagen), while large, non-publicly traded companies will be excluded (ex: The U.S. Department of Defense). Note that the data also excludes franchise employees. We’ll start with the overall chart, then pull out a few key observations. Walmart trounces the field. With 2.2 million employees, it’s roughly four times the size of runner-up Volkswagen AG. Meanwhile, McDonald’s ranks seventh with 420,000 employees. 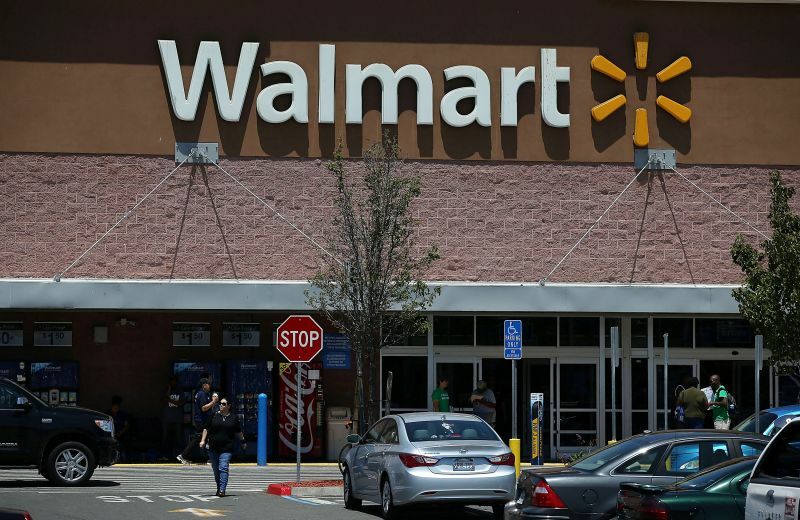 Part of Walmart’s advantage here comes down to franchising. While McDonald’s has nearly three times as many locations as Walmart (~14,000 vs. ~5,000), every Walmart location is owned and operated by Wal-Mart Stores Inc. Meanwhile, roughly 90 percent of all McDonald’s locations are franchises, where McDonald’s licenses its brand and business model to separate, individual owners. That said, even if we included every McDonald’s employee at every franchised location, Walmart would still come out on top by about 200,000 employees. Yum Brands Inc.—owner of Taco Bell, KFC and Pizza Hut—places third. Like McDonald’s, the company has enough corporate employees and company-owned locations to comfortably crack the top 10. Deutsche Post and the United Parcel Service—two package service companies with enormous delivery staffs—rank fourth and sixth, respectively. While classic mail services have declined significantly in the last couple of decades, parcel delivery remains a giant, human-powered industry. What’s more, Deutsche Post and UPS have shown greater recent workforce expansion than any other companies on this list, each topping 10 percent growth year over year. Time will tell whether an Amazon drone service will disrupt the industry in the coming years. In contrast to parcel delivery services, most massive technology companies have comparatively few employees, relative to their yearly revenue. Apple, for example, made about three times as much as UPS in 2014, despite having less than a quarter of the employees (about 100,000). Facebook is even leaner, with just over 10,000 employees. The exception to this rule, however, is International Business Machines (IBM). With over 400,000 employees, IBM is enormous for a technology company, with approximately four times the workforce of Google (now, Alphabet). The explanation? Hardware and consulting. While Google and Facebook invest the most time and money in software—which can be developed by a small team of engineers—IBM employs factory workers and traveling consultants in every corner of the nation. The one name most Americans may not recognize is Gazprom, another foreign company that trades in the U.S. market. Gazprom is the largest extractor of natural gas in the world, with a complex network of transportation and logistical employees around the globe. The ninth and tenth spots on the list belong to familiar American brands—Kroger and Target. Kroger is the country’s largest supermarket chain by revenue, while Target is the second-largest retailer in the United States, behind (what else?) Walmart.